Planning to go to Keukenhof directly from the airport? 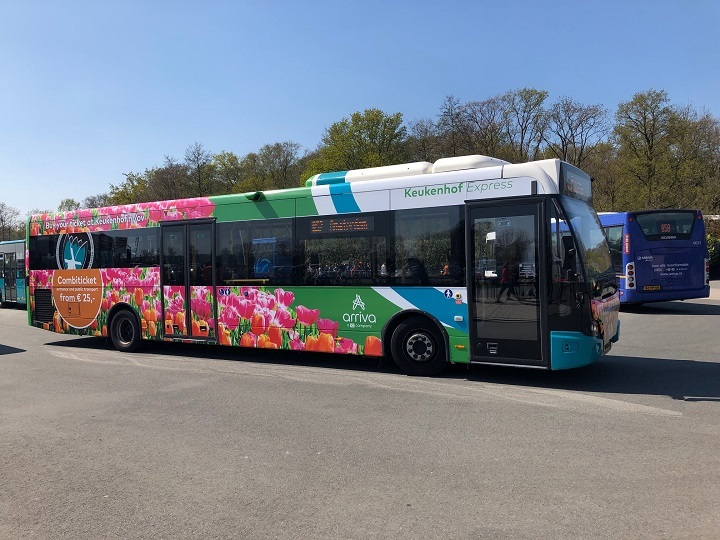 During the Keukenhof opening season (21 March – 19 May 2019) you can travel by the Keukenhof Express (bus line 858). It will take you from Schiphol airport to the gardens entrance. How to find the bus 858 in Schiphol? 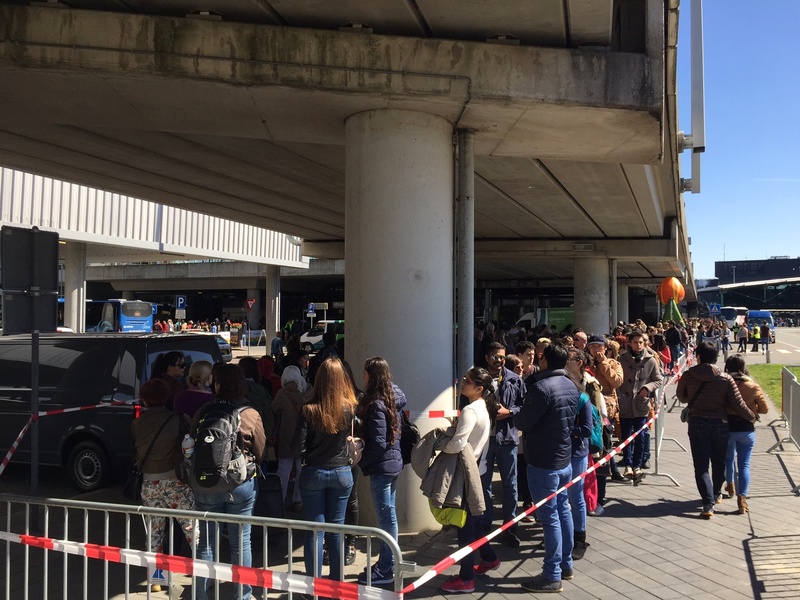 The Keukenhof Express departs from the bus stop outside Arrivals hall 4 (near the Starbucks). Just walk outside from Schiphol Plaza and follow the signs. An average travel time from Schiphol airport to Keukenhof is 30 – 35 minutes. Please mind that during the peak season (end of April – beginning of May) and during the weekends there can be traffic jams on the way to Keukenhof. A single bus ticket from Schiphol airport to Keukenhof costs € 5 one way and can be purchased from the driver. It makes sense to buy a combi-ticket (entrance + travel) which costs € 25 for adults and € 13,50 for kids. Can I use my GVB ticket in the Keukenhof Express? No, bus 858 is operated by Arriva. Your GVB ticket, as well as I Amsterdam city card won’t be valid in the bus. 50 (station Haarlem – Keukenhof). What types of tickets are valid in the Keukenhof Express? Is bus 858 accessible to passengers in a wheelchair? Does the bus 858 have any in between stops? No, it is a direct and nonstop bus that brings you to the main entrance of Keukenhof. See you in the Keukenhof gardens! What times do the busses leave the airport and leave Keukenhof back to the airport? Please see the timetable of bus 858 here. If we take the 858 bus directly from the airport to the gardens, will there be a place to store our luggage on either the bus or at the gardens until we are done touring? There are free lockers available for luggage at the Gardens according to their website. Is there space on the bus 858 to put our luggage (1 large roller duffel each) when we travel to and from the Gardens? We would store our luggage at the Gardens while visiting. Thank you! You can take your luggage to the bus 858. But please keep in mind that it’s a regular, not a touring bus. It doesn’t have a special luggage compartment, so you will need to take your bags in the bus full with people. Here are the general rules of Arrive transport company which operates the bus 858. Voor het vervoer van een rolstoel in onze bussen en treinen gelden de Europese richtlijnen. Bekijk de algemene voorwaarden stads- en streekvervoer voor meer informatie. Scootmobiels zijn in de bus niet toegestaan. It says that wheelchairs of certain sizes can board the bus, but mobility scooters unfortunately not. Hi, can I leave from Schiphol and return to Amsterdam? Is there a combi ticket for this? You can use a combi ticket for your trip Schiphol – Keukenhof – Schiphol. And then take bus 397 (6 EUR) or train (5,10 EUR) to Amsterdam from Schiphol. There is no direct public transport from Keukenhof to Amsterdam anyway, you have to travel via Schiphol or Leiden. Hi, can we use Trainpakkers: Superdal Day ticket for 2 persons (€ 13 pp) for bus 858 ? No, you cannot use a train ticket in the bus 858. Hello… We are a group of 20 travelling to Tel Aviv, Israel with 9 hours layover in Amsterdam. We want to visit Keukenhoef Gardens. Is there a bus just for us that we can hire so that we do not have to line up. I was there in 2014 and the line up was long except that I requested the kind guard that I wanted to go inside if no one else wanted because I am used to standing in our TTC here in Toronto. He was kind enough to let me in so that I saved time. Thanks. Hello, you can try making inquiries at the companies offering private bus transfers or bus companies like Flixbus who rent busses with a driver. I hope they can help. P.S. I see that Flixbus also gives a possibility to get a quote and book a bus online. The price depends on the number of passengers and duration of the rental period. Hi. If we buy the combi ticket can we use the return trip on another day (i.e., we might want to stay an additional day near Keukenhof)? Generally, a combi-ticket to Keukenhof is valid for one day (on the day when it’s scanned for the first time). For 10 euros you can purchase a day ticket for Bus 858 (Schiphol Airport – Keukenhof) or 854 (Leiden – Keukenhof) from the Keukenhof Express bus driver. You cannot pay with cash on the bus, only with card. Greetings from Malaysia! We will be travelling with our pet dog a toy poodle and would like visit Keukenhof. Is pet allowed on the Arriva bus? Here is what Arriva website says about travelling with pets. Hello.. Does the bus stop anywhere in between – e.g. Lisse city centre? Keukenhof Express bus (number 858 from Schiphol and 854 from Leiden Central Station) is direct and non-stop. However you can use a combi-ticket in a regular bus number 50 (to/from Haarlem) which has numerous stops on its route. Hello, is it possible to take the 858 bus from Schiphol to Keukenhof using the Amsterdam & Region Travel Ticket? And what is the schedule for bus number 858? Yes, Amsterdam & Region Travel Ticket is valid in the bus line 858 (Schiphol Airport – Keukenhof). It departs 4-12 times a day, depending on the season. The schedule for 2019 will hopefully be available by the end of the month. P.S. Amsterdam & Region Travel Ticket is also valid in bus lines 852 (Amsterdam RAI – Keukenhof), 854 (Leiden CS – Keukenhof), 859 (station Hoofddorp – Keukenhof) and bus line 50 (station Haarlem – Keukenhof). On Saturday (King’s day) it will probably be less crowded in Keukenhof because many people will stay in cities to celebrate the King’s day. It’s better to travel directly from Schiphol because on the King’s day transport inside Amsterdam is working with limitations. Hi does anyone know whether the bus route 858 schedule for year 2019 is out yet or not? There will be a separate folder with the bus line 858 departure times in 2019 closer to the Keukenhof opening season. Are the combi tickets (for entrance and travel) only available online or is it possible to purchase them at the bus driver ? The bus driver sells only travel tickets. But there are sales locations in Schiphol where you can buy combi-tickets to Keukenhof. The article above contains answers to both of your questions. The queue is big, you can see it on the photo above. Moreover, 13 April is the busiest day of the whole season due to the Flower parade. Since I understand Bus 50 from Haarlem does not travel directly to the Gardens entrance, how close to the Keukenhof entrance does it get? Where is the bus stop? You need to travel to the bus stop De Nachtegaal, Lisse. The gardens entrance is 10 – 15 minutes walk from there. Hi, I dont know if there is any “rainy day policy”, so I think I will buy the ticket at the airport. About this, two questions, do you know where exactly can I get it at Schiphol Airport? and the other one, Do I have to considerer a long waiting time in line to get the bus at airport? I will be in Amsterdam just for a layover of 7 hs, that is why I ask. Thank you! Francisco. Yes, you can get the tickets at the airport. 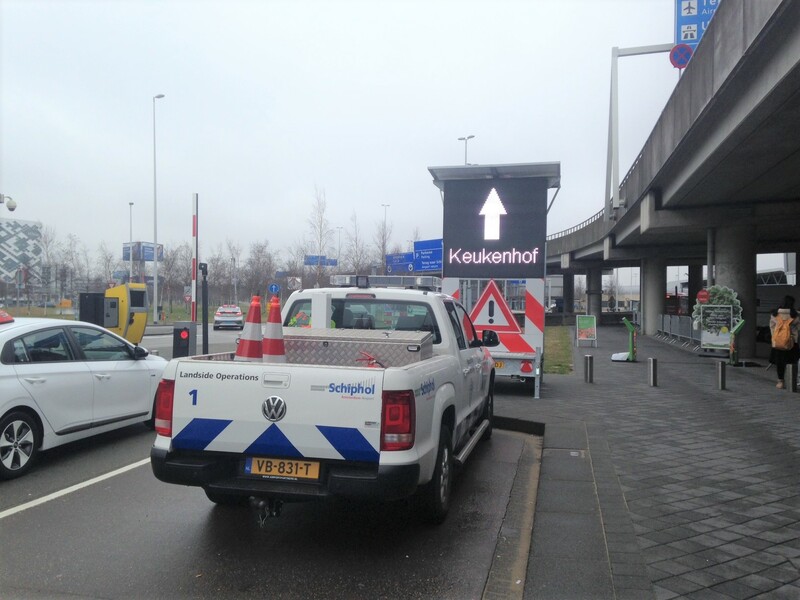 I don’t know the exact location, but usually direction signs in Schiphol are very clear. The lines can be huge, depending on the day and weather. I was looking for information about travelling to Keukenhof and found this very helpful thread. Thank you for helping us. My question is about combi-ticket. We are a famly of 4 with 2 kids. We are planning to leave from Amsterdam, Europaplein/RAI taking bus 852 to Keukenhof and leave by bus 858 to Schiphol. While the kids ticket has all the destinations, the Adult has sperate tickets for Amsterdam Europaplein(€30) and other destinations(€25). We are happy to pay for the higher price tickets, but not sure if bus driver will allow us to return to a different destination. Hope I’ve explained clear enough. Hi Xin, yes, I understand the question, but unfortunatelly I don’t have an answer to it. Personally I think this should not be a problem, especially because you pay a higher price. But there is no official confirmation on the Keukenhof or Arriva websites. I will be in Keukenhof this week. If I manage to get more information, I will publish an update there. Thanks for your lightning reply. We can still buy the entrance tickets online and buy the bus tickets from the drivers. Welcome to Keukenhof, the most beautiful spring park in the world. nearest bus stop and departure times. Hi Xin, thanks a lot for sharing! Many people have the same question as you, so it’s very helpful for other travellers. Thanks! hello, I bought 3 combo tickets from your site, me and my family. I received 3 tickets with a single number. Will this be a problem . No, this is no problem. The number on top of your ticket is your order number. It’s the same for all tickets within one order. At the bottom of each ticket you see a barcode. They are unique for every ticket. These barcodes will be scanned in the bus and at the park entrance. I purchased the ticket online, so I need to print out the ticket? No, mobile voucher on your phone is enough. Hello, your thread is awesome,thanks for all advices! We are in three and have a flight layover of 4-4,30 hours. We would like to make a short visit to the Park and come back to Airport. In the worst case of crowded lines I was planning to take a taxi to take us faster. Is it possíble from your experience to do that(traffic jams on sunny days) ? We know it won’t be possíble to see much but,still we think it’s worth it to try without missing our next flight. Thank you! Hi, the gardens and the roads are the most crowded in the weekend and between 11 and 15 o’clock. So your travel time depends on the time of your visit. But I think 4 – 4,5 hours should still be ok for a short visit. Thank you for your reply. We are arriving at 9:30 in a wednesday. So we hope we can make it! and what about travelling with a baby (10 months old), is there room for a buggy? Yes, there is space for two buggies or wheelchairs in the bus. I will be reaching Amsterdam on April 13th 9.30 am and planing to head to Keukenhof garden straight from airport and plan to see the Flower parade in Keukenhof where it is be around 3.30pm. After the parade I will go back to Amsterdam City center. Considering the flower parade, will there be any distrubance in bus service in the morning and what would be the traffic after parade as many people will travel. Can you informações If the 858 bus stop at Ibis Airport Hotel? Line 858 is a non-stop bus from Schiphol airport to Keukenhof. You can travel via Haarlem. The first bus to Keukenhof (line 50) departs at 07:10. Combi-ticket is valid in this bus. According to the Keukenhof official website, Amsterdam and Region Travel ticket is valid too. We will be 4 adults staying at Zandfoort ann see. The first 2 days we will be going to museums in Amsterdam then 3rd day to Keukenhof. Is it better, for time and economy, for us to buy Amsterdam and region tickets for 3 days and pay for the entrance to Keukenhof, or to take 2 days travel ticket then buy a combiticket from Haarlem to visit Keukenhof on 3rd day?. I want to buy a combi ticket for travel to Keukenhof from the Hoofddrop station. When I go to the ticketbar website I see tickets for “Transfer from Amsterdam”, “Transfer from Schiphol”, “Transfer from Haarlem”, “Transfer from Leiden”, but I don’t see “Transfer from Hoofddrop” listed. If I buy one of the listed combi tickets, for example “Transfer from Schiphol” would I be able to use that ticket to transfer from Hoofddrop instead? Yes, combi-ticket which costs 25 euro is valid from Schiphol, Haarlem, Leiden, Hoofddorp and back. I saw information on official Keukenhof website that there will be no busses 858 to and from Keukenhof garden on April 13 2019. Can you verify this information? The Dutch version of Keukenhof official website says “Op zaterdag 13 april 2019 rijden er enkele uren geen bussen naar en van Keukenhof vanwege het Bloemencorso” (there won’t be buses to and from Keukenhof for a few hours), which I guess is more close to the truth. Hi, am traveling to Amsterdam on 16 April and thinking of going to Keukenhof from airport directly. Is there a place in airport to keep my luggage and pick it on the way back. I’m planning to visit Keukenhof park today. I have already bought the Combiticket via internet. But I have found note that on Saturday 13 April 2019 there will be no buses to and from Keukenhof due to the Bloemencorso or flower float parade. Please advise how can I reach the park today? I want to see the flower float parade…. Is there a separate queue to board the bus if one needs to purchase the ticket from bus driver? No. But I can say it only from my own experience. It can probably be organized different in other situations. Hello we have bought just the entrance ticket of keukenhof garden. Can I buy travel tickets directly from bus drivers? Can I buy direct tickets for any bus like 852,858 etc from drivers? What kind of card do I need to have credit card or regional Amsterdam travel card to pay to the driver? Thanks. You can buy tickets directly from the driver in any of these buses. You can pay with Visa, Mastercard or Maestro card. Will this day be very crowded and traffic jam along the way ? It will probably be crowded but not more than on any other weekend during the peak season (end of April – May).